Just moved flats and so there are new bicycles to look at in the many bike sheds. This is nice. A splash of green summer non-chalantly placed on a back rack. For no other reason than it looks nice. 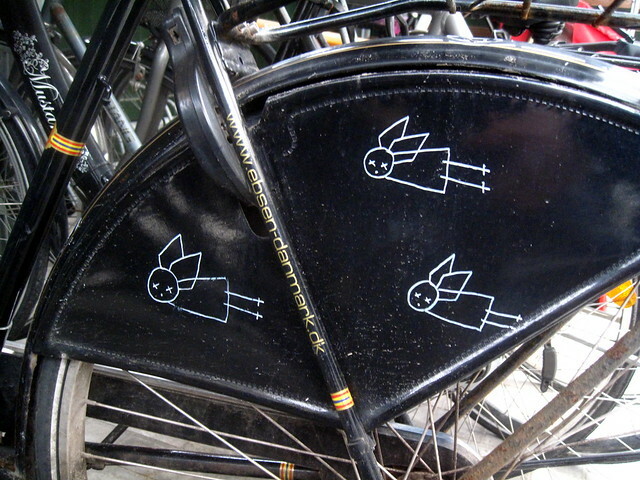 And lovely little angels drawn on a black skirtguard. "Designer Dutch luggage carrier grass by Basil. Do you dream of a meadow in the city, yearn for spring, and the park is too far away? Now you can have it all within your reach. All your friends will want you to take them on your rack, where they'll feel as if in the bosom of nature. 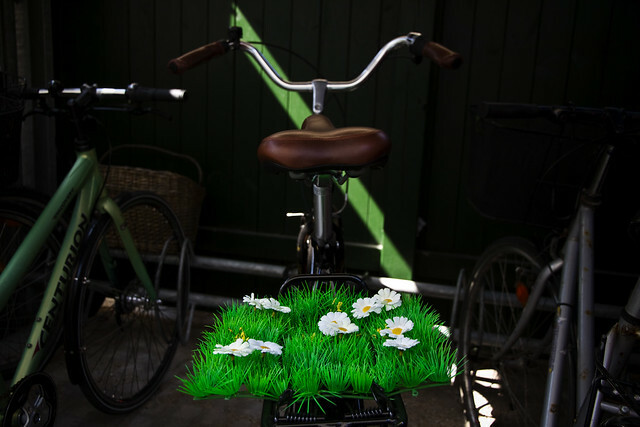 -an imitation of a green lawn, daisies and lilies of the valley"
urban bicycle gardening ~ i love it! they are also on the book "The Stupidest Angel" by Christopher Moore. Great Book, By the way. FYI, the little angels are the logo from the Danish band Mew. wow, the grass on the back looks great ! where can I get one? that totally rocks.